Also known as "Un musicien dans la famille"
"The young son of a prairie farmer, against considerable opposition, achieves his ambition--a musical education. 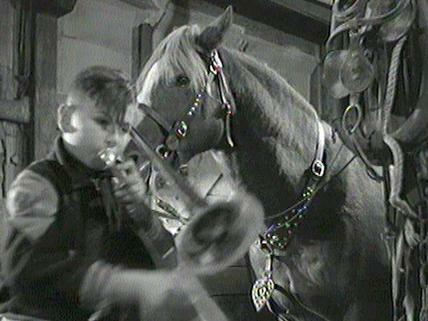 Andrew's father fears that a musician in the family may affect the future of the farm, and tries to discourage the boy's attachment to his trombone. On Andrew's side are his mother, his teacher and a neighbour, while the farm animals patiently serve as his rehearsal audience. Perseverance wins him a place among the contestants in the annual provincial music festival, and the encouraging words of the adjudicator help sway his father to acceptance of the boy's music." National Film Board of Canada. "NFB -- A Musician in the Family." National Film Board of Canada. http://onf-nfb.gc.ca/en/our-collection/?idfilm=11183.